Looking for a peaceful place to get away from it all and feel closer to nature? Look no further than Brownsburg, Ind., where a new park has opened that combines an easily accessible location with a serene and beautiful atmosphere. Northwest Community Park is a spacious and lush area situated behind Bethesda Baptist Church. The park is maintained by the church as a way to bless the community, and the care and attention put into the park is obvious. The area is clean, well maintained and furnished with everything you need for a day of family fun. The biggest draw for my family was the 3-acre fishing pond. 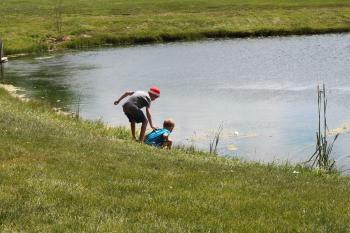 Catch-and-release bank fishing is permitted at the pond, but my boys loved simply gathering at the edge to watch tadpoles swim in the water. The pond is conveniently located at the front of the park, near the picnic shelter, which makes it easy for parents like me to keep an eye on little ones. There are also benches located around the pond if you simply want to sit and enjoy the view. If you&apos;re looking to get a little more active, the park also features an 18-hole disc golf course, as well as a walking trail. As you make your way along the trail you&apos;ll encounter a flower garden with more seating areas along the way. You may also discover a vegetable garden in the park during your trek that the church uses to stock local food pantries with fresh produce. Along with all of these amenities, there are plans to add a playground to the park in the future. If you&apos;re looking for a gorgeous spot to enjoy a picnic, some fishing or a round of disc golf, Northwest Community Park is the place to go. We&apos;re already planning a return trip with our fishing poles, and my boys think the wide open spaces are perfect for a game of tag. I&apos;m looking forward to reading a book by the water while they wear themselves out! 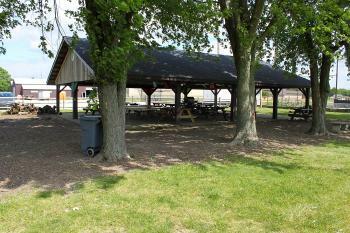 Northwest Community Park is located at 7950 N. County Road 650 East in Brownsburg, on the grounds of Bethesda Baptist Church. The park is open from dawn to dusk.